This is a guest post by Sarah Mwangi, the Kenyan coordinator at one of our Medical Partners, African Mission Healthcare Foundation. 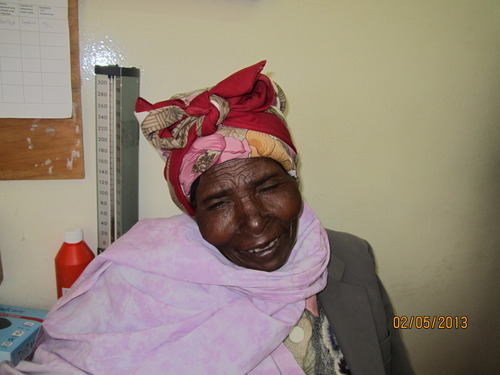 Sarah is responsible for identifying patients and walking them through the Watsi process. 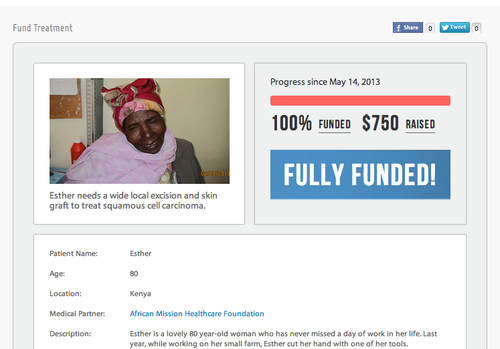 She’s made it possible for more than 100 people in Kenya, Tanzania, and Ethiopia to access medical care funded by Watsi donors. Every day I get the opportunity to experience firsthand what Watsi is really doing. I see it when chronic wounds heal. I hear it in the words of grateful parents. I feel it in the tears of mothers who are extremely overwhelmed. It’s Monday morning. I pick up the telephone to make one of my usual routine calls in Kiswahili. Hello, Beatrice? My name is Sarah and I’m calling you from Kijabe Hospital. I am calling to let you know that your mother, Esther, will be discharged tomorrow. I also wanted to ask if you could come early so that I can make sure you are cleared by the accounts office without being asked for money. In her local dialect, Beatrice starts to cry out. I sit at my desk and go over the conversation in my mind. Instantly, I’m aware that my ‘routine’ phone calls, in reality, are far from routine.